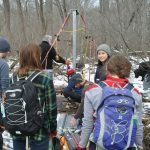 A dedicated, select group of geologists, physicists, archaeologists, political scientists, biologists, english and history majors joined forces to learn a bit about Climate Change in the natural laboratory of Northeast Ohio. 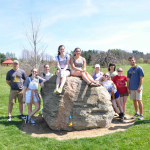 Here they surround a glacial erratic in Secrest Arboretum of the OARDC – here we have meteorological records extending back to the late 1800s CE and a pretty extensive collection of stands of trees that are used in our climate studies below. Dr. Lowell gives the rundown at Browns Lake Bog – Tom is a professor at the University of Cincinnati and long-time collaborator and the core boss. The Upshot of the Lake Work – The two ages were chosen at transitions in the character of the peat and mineral matter – we identified a major shift at the time of the Bolling – Allerod warming and at the cooling of the Younger Dryas. The abrupt climate changes and discussion of how the world moves from the Pleistocene to the Holocene is brought home to Ohio in this core (Figure below). Hong Kong dendrochronologist, Vincent shows the class how by standing on two milk crates he cores a beam – the instructor adds a stabilizing foot to the precarious sampling strategy. The upshot of Barn Dating: Ten of the beams from the Biggio Barn were cut in the spring of 1840 CE. The building then was likely constructed shortly after that cut date. A copy of the report to the owner from the class can be found here. The ring-width data obtained in this study are used in drought studies below. 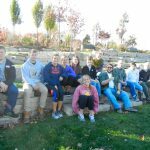 The team of researcher (with out Vincent) who did the Kamchatka study at Wooster Memorial Park where a recent planting of 700 trees and prairie will sequester more carbon in the future than the previous agricultural land use. 1 – The Kamchatka larch tree-ring widths are most sensitive to summer temperatures. 2 – The team recommends the RCS method for standardization with a sample size of 190 series. 3 – The RCS series showed similar trends as the NTREND series, suggesting the Kamchatka site follows similar trends as the rest of the northern hemisphere. 4 – Ring-widths show a general increase in temperature over the last 350 years for the interior of Kamchatka. Above is a histogram showing the correlations of the Johnson Woods ring-width series and monthly precipitation and temperature records from the OARDC spanning 1880 to 2014 CE. 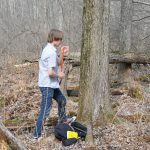 What is the Climate response of European Larch to climate of Ohio – Secrest Arboretum (and why might it be relevant?). The upshot here is the ring-width chronology below. The class worked on this as part of the final exam and found that similar to the oaks in the region, the European Larch is sensitive to summer precipitation and is stressed by high summer temperatures. The tailing off of the ring-widths during recent decades could be the result of warmer summer temperatures – a hypothesis that needs testing. The relevance of this study is that as climate changes in the high latitudes of Europe and Asia, where larch dominates – it may be the case that warming may stress the species leading to decreases in bioproductivity – these ideas need further work to test if this is a viable hypothesis. 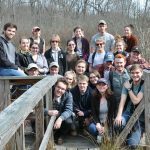 The class wanders around the gas power plant on the Wooster campus – two years ago the college transitioned from coal burning to natural gas – the carbon dioxide emissions on campus have been cut in half. However, now the College buys its power for cooling (air conditioning) off campus from the grid, where much of the electricity is powered by coal, but with a growing portfolio of clean energy sources (special thanks to Lanny Whitaker who showed us the plant and explained where our energy comes from – thank you). We also thank Nick Wiesenberg (our able Geology Technician) for his knowledge of trees, barn dating and general troubleshooting, Tom Lowell and his students for the high quality sediment cores, our TA Dan and a host of tree-ring scientists who contributed data to our efforts in this course. A portion of the Kamchatka tree-ring record was supported by NSF- AGS – 1202218. The purpose of this study was to analyze larch (Larix cajandery Mayr.) tree ring width from Kamchatka, Russia data to understand climate forcings. The tree ting width chronology was standardized the chronology using two methods, linear regression and negative exponential standardization, and regional curve standardization (RCS), to compare how the standardization technique influences correlations. Both standardized series were correlated with meteorological records showing high positive correlations for summer temperatures. The RCS showed stronger correlations and was used for NTREND comparison, temperature reconstruction, and spectral analysis. Together these correlations and comparisons showed the larch primarily responds to summer temperature and can be used to reconstruct summer temperatures. Figure 1. Kamchatka Peninsula is 1600 km long and located in far east Russia. It is the home to roughly 300 volcanoes and 450 glaciers. Most of the glaciers are located along the coast, where temperature are cool. There were positive advances in glacier and moraine building at the end of the 19th century and early 20th century. 1 – The Kamchatka larch tree-ring widths are a good proxy to reconstruct summer temperatures due to their high positive correlation. 2 – We recommend the RCS method for climate response analysis since the RCS method showed higher correlations. 3 – The RCS series showed similar trends as the NTREND series, suggesting the Kamchatka site follows the same climate signals as the rest of the northern hemisphere. 4 – Temperature reconstruction shows a general increase in temperature over the last 350 years. Frederick, S., 2014, Coring Across Kamchatka: Wooster Geologists: http://woostergeologists.scotblogs.wooster.edu/tag/russia/ (accessed April 2016). Solomina, O.N., Bradley, R.S., Hodgson, D.A., Ivy-Ochs, S., Jomelli, V., Mackintosh, A.N., Nesje, A., Owen, L.A., Wanner, H., Wiles, G.C., Young, N.E ., 2015, Holocene glacier fluctuations: Quaternary Science Reviews, doi:10.1016/j.quascirev.2014.11.018. Using tree cores from Johnson Woods (JW) graphs and spatial correlations were constructed to track precipitation (PPT) and temperature (T) going back to the 1600. JW ring width (std), standardized using RCS, and data from NTREND (C). RCS preserves low frequency signals, including potential climate signals. 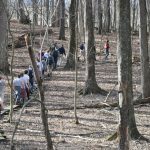 The class mills around the gas power plant – most of these students have seen the transition of a coal burning plant to a gas during plant – the carbon dioxide emissions on campus have been cut in half. However, now the College buys its power for cooling (air conditioning) off campus from the grid, mostly powered by coal, however it is getting better and we will get there in time. (special thanks to Lanny Whitaker who showed us the plant and where our energy comes from – thank you).